The fourth primer in Daniel Goleman et al’s series on Emotional Intelligence is entitled “Achievement Orientation” – as summarised in this illustration. The authors highlight the difference between what individuals might have excelled at early on in their professional careers vs. what it might take to get them to the next level of management or leadership. This booklet seems particularly apt to illustrate some of the key concepts that my colleague Liz Mercer and I explore in RiverRhee’s course on the Transition to Leadership. According to Goleman and his co-authors, the best leaders balance their personal drive for excellence, continuous improvement, challenging goals, and calculated risks with an understanding of the needs and goals of the organisation and of the people around them. Richard Boyatzis shares an insightful perspective on “toxic” leadership. He suggests that indications of a “toxic’ leader are when they micromanage, and demonstrate unhappiness or stress. According to Boyatzis, these signal an over-emphasis on personal goals, as opposed to a more balanced concern for the team and for their and the organisation’s goals. According to Richard J Davidson, we can also develop greater proficiency in “Achievement Orientation” through our understanding of the brain as illustrated below. The pre-frontal cortex supports the thinking associated with setting goals. 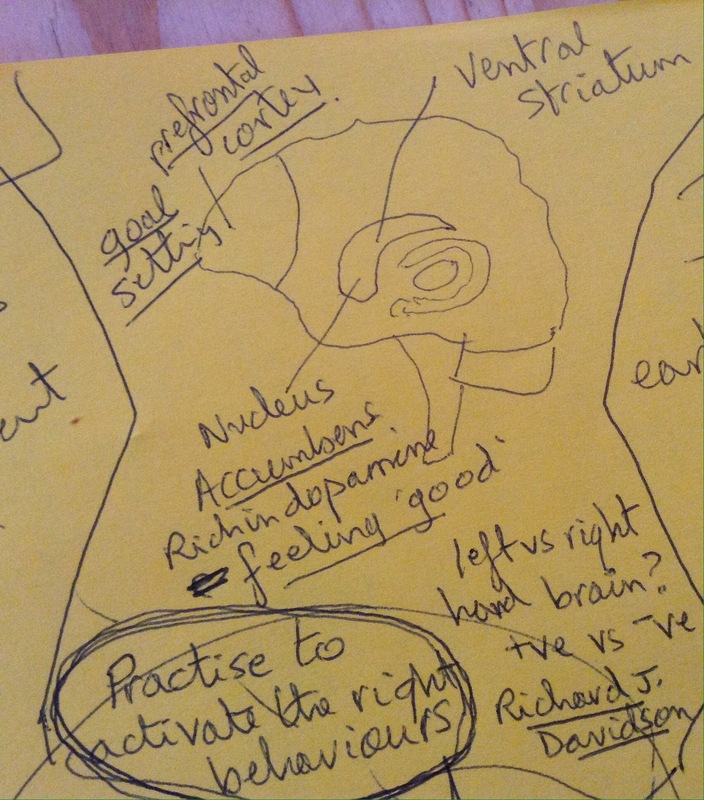 The nucleus accumbens is rich in dopamine and helps us to feel ‘good’ about what we are doing. Davidson suggests that the left and right sides of the brain can respectively support or act against a positive approach to goal setting and to feeling ‘good’ about it. As with all things, practice will help to activate these parts of the brain and so help us to get better at achieving the right balance of personal drive and support for others’ goals. Each of the twelve primers in the Building Blocks of Emotional Intelligence has a chapter by Vanessa Druskat where she describes the behavioural norms that teams might demonstrate. 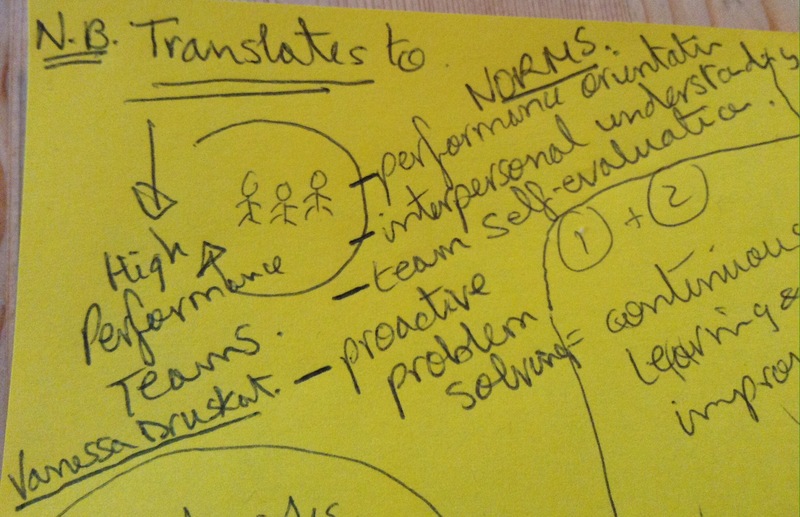 Druskat and her colleagues studied the performance and behaviours of a number of high performing and average performing teams. According to Goleman, leaders who demonstrate “Achievement Orientation” will have the tenacity to overcome obstacles and set-backs. They will also be both bold and realistic in their approach to risks. They will pick the right peg in the ‘ring toss game’ or ‘hoops’ – far enough to stretch them and the organisation, but not so far as to risk disaster! These concepts are also illustrated in my full-page summary of yet another fascinating booklet in Goleman et al’s series on Emotional Intelligence! I passed the time at the airport on my way here watching a very funny, heart-warming and thought provoking video of Shawn Achor giving a TEDx talk. His 5 simple exercises for creating a positive mind-set are indeed very simple and I can confirm, from my own experience, that they are very effective. What struck a chord though, was Achor’s reminder of something that I had also read recently in a Harvard Business Review article (more on this below), that, too often, we wait to succeed at something as a milestone for being happy. “I’ll get this project completed and then I will be happy” or “I’ll just get these tasks done and then I’ll be satisfied”. The tasks or projects could take a few moments, a day, a week or several months. It seems a shame to defer our happiness until then. They might not even happen, or be transformed into the next thing before we get a chance to finish them. Better surely to find a way to enjoy and gain satisfaction from the moment, from work in progress? Perhaps we could pause periodically and ask ourselves: “What am I enjoying most about what I am doing now?”; “How could I make it even more enjoyable?”. We may be able to find satisfaction in even the most mundane, repetitive or stressful task. In fact this awareness, and self-awareness, will also help us to identify ways in which we could continuously improve our work and ourselves. We may even be doing the thing we most enjoy, in which case we should definitely be celebrating, even if only with an inner smile! In their excellent article in the May-June issue of Harvard Business Review (HBR), Jennifer Petriglieri and Gianpiero Petriglieri, discuss the stresses experienced by people at work who have been identified as talented “future leaders”. Opportunities to explore and experiment, to perform in any more individual, divergent, way to this ideal, become few and far between. It becomes increasingly difficult to reveal the more rounded aspects of their personality, or anything that might be perceived as “weakness”. Not surprisingly, the author’s suggested remedies include valuing the present. In fact, they suggest that this is the most important remedy for “breaking the curse”, and that individuals must make what they are doing now matter. Their other two suggested remedies are to be authentic i.e. bring your whole self to work, rather than just the aspects that are supposed to reflect your talent; and to “own your talent” in such a way that you recognise it as something to be developed in ways that can include help from others. There is definitely happiness to be found from living in the moment, rather than waiting for deferred gratification from something that may or may not happen. Which of the above approaches have you tried, or will you try? What other approaches you have found to be successful? Why yet another article about leadership? I’ve had an unusually busy few weeks so the gap between my blogs has been greater than usual. However the magical combination, for me, of coming across an inspirational article, engaging with enthusiastic people, and listening to others’ ideas at a conference has finally triggered my own reflections! So, this blog is about leadership. As Julia Hordle, a speaker at this week’s Perfect Information 2014 (#PIC2014) conference, pointed out, there is already a lot of literature on this topic. So, like Julia, I’m not making any claims to be an expert, nor am I going to try to cover the whole area. These are just a few points that have struck me in what I heard from her and others this week. 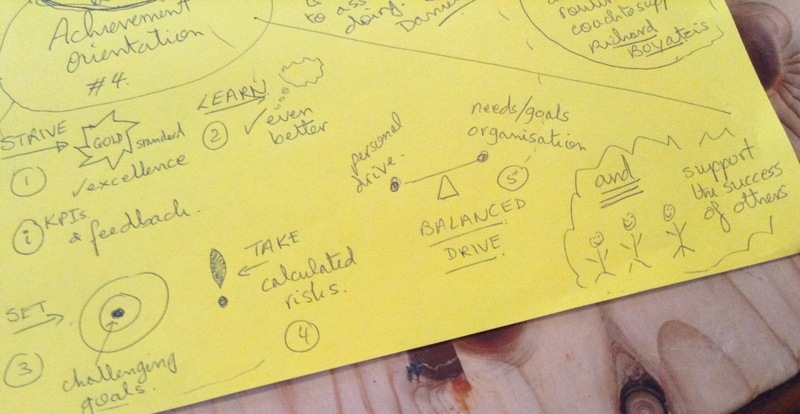 It was whilst I was at GSK that I was also introduced to ‘Lessons from Geese‘, inspired by Milton Olson, and beautifully captured in the video by Breakthrough Global. Amongst the several lessons is that of everyone taking a turn at doing things, rather than expecting the team leader to do it all. Julia Hordle shared another video, Lord Digby Jones’ 5 tips to business where he encourages leaders to train their teams to do the simple things well so that, when they are faced by challenging tasks, their intuition can kick in and so, by implication, exercise leadership in what they do. As my co-speaker, Steve Boronski, pointed out during our joint workshop at #PIC2014 on “Project Management through a knowledge and information management lens”, when everyone within a team is clear on what they are expected to do, and has the training to do it, then the team leader’s role is ‘simply’ that of managing by exception: providing the support and direction to deal with the unexpected. Also on this point, the article that has inspired me to write this blog is the one on Blue Ocean Leadership, by W. Chan Kim and Renée Mauborgne, in the May 2014 issue of Harvard Business Review (pp.60-72), pointed out by my business colleague Sarah Hillman. There are some terrific insights in the article on the behaviours of ‘to-be’ as opposed to ‘as-is’ leadership. I particularly liked the concept of “inspiring people to give their all as opposed to holding people back”. A member of the audience during Julia Hordle’s presentation at #PIC2014 quoted some recent figures, one of those bold generalisations, to the effect that women will only consider taking on a new position when they are 80% sure of their capabilities to deliver it, whereas men will do so when they are 50% sure. The delegate wondered whether this might have a bearing on the behaviour of leaders. I, like many others, dislike such generalisations but they can also be food for thought. Another member of the audience (a man) responded that there might be some truth in this because he does not hold back, as a leader, from voicing opinions that others might consider stupid. The discussion continued along the lines that leaders, and indeed any team member, should be confident enough to air their views. This will benefit the team in the long run and, although it may carry risks for the individual, being true to yourself does ultimately deliver benefits to you too. Which brings me to the particularly enthusiastic people that have inspired me this week. I spent a very enjoyable hour with some young entrepreneurs on the Peter Jones Enterprise Academy course at Cambridge Regional Centre. We were exploring the topic of team make-up and leadership. At a certain point I asked them to write out their personal strengths on individual post-it notes: the strengths that they might bring to a team. About 60% of the notes carried the word ‘confidence’! They certainly came across as a very confident set of people. At least 3 of them had already set up their businesses, in such areas as luxury goods and organising musical events, and many of the rest were looking forward to doing so as they moved on to their business degrees. What made those young entrepreneurs so enjoyable to speak to was that not only were they very vocal and articulate, they were also clearly listening to and reflecting about what we were discussing. Amongst the many post-it notes about confidence, there were also several with the words ’empathy’ and ‘listening’. Julia Hordle and Lord Digby Jones had a lot to say about the importance of a leader’s communication skills (as listeners as well as conveyers of messages), and their ability to inspire trust. 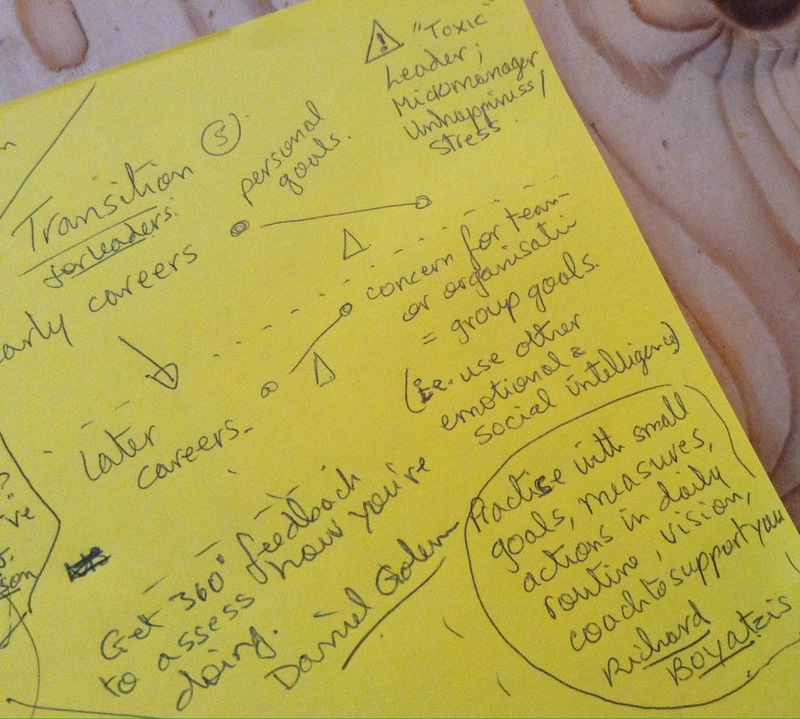 A leader’s ability to empathise is something I’ve explored in a previous blog. I came away from my interaction with the PJEA students feeling quite enthused about the qualities that many of them would bring to their future roles as leaders. Elisabeth is an expert in knowledge management, and is accredited in change management, Lean Six Sigma and MBTI (Myers Briggs Type Indicator). She has a BSc in Biochemistry, an MSc in Information Science, is a full member of the Chartered Institute of Information and Library Professionals (CILIP) and of the Association for Project Management (APM) and is also registered as a Growth Coach and Leadership & Management trainer with the GrowthAccelerator. Holidays are an excellent time to catch-up with my reading, so I have just had a very stimulating week reading Rob Yeung’s “E is for Exceptional”. I’ve previously enjoyed Yeung’s books on networking, and emotional intelligence, and picked this one up at random, not really knowing what to expect. It’s a gem! Like his other books it’s extremely readable – with anecdotal illustrations from the many exceptional people that he has interviewed, backed up by references from the literature, exercises to start developing our own capabilities for being exceptional and summaries at the end of each chapter in case we missed anything. I would strongly recommend everyone to read this book, but in the meantime, here’s my own interpretive summary. I’m always sad when I come across people who feel glum or worse at the start of the working week. I’ve wondered if I’m naïve to think that people have a choice: that they could take the plunge and go for something different. Rob Yeung backs me up: he calls this ‘authenticity’ and suggests that we should absolutely be true to ourselves and find work that is inspiring: what we enjoy most and are good at. It’s what will help us feel fulfilled and, whilst doing it, put us ‘in the flow’ – where time just goes by without us noticing. If we find and do what is authentic to us, Yeung maintains that the money will follow! Being ‘authentic’ does not necessarily mean completely changing what we’re doing – it may be possible to craft a current job or role to bring it closer to what we enjoy doing the most. This relates to other blogs that I’ve written about taking a self-employed attitude when working for an employer. Fostering this may also lead to greater employee engagement and empowerment. The idea of writing a business or team vision is well established – that of writing one for ourselves as individuals is less so. Yeung makes a strong case for both developing and writing down our personal vision. A vision acts as a framework for our ‘authenticity’. It helps us create work-life balance so that we give enough time to all the things that are important to us: family, friends, physical health, social activities or anything else, as well as our work. It helps us enjoy the ‘here and now’ and avoid ‘destination fixation’. And it puts our shorter term goals into a longer term context so that we can make sure we don’t get inappropriately side-tracked. Up till now my personal vision has been very much in my head – but I’ll be writing it down, referring to it and refreshing it as Yeung suggests. I’ve written my first draft. I’m following a different order in describing these capabilities than the one in the book, because I believe that finding our area of ‘authenticity’, and then putting it within the context of a personal vision gives us the focus from which everything else can flow. Daring is then all about taking action: pursuing opportunities that come our way even if they’re scary, but with the conviction that they’re the right thing to do – as I did in starting my own business! Being daring is about doing things that we would otherwise regret not having done. But it’s also about articulating these daring activities as individual goals, with specific measures (so we know when we’ve succeeded), timelines (to avoid procrastination), and a series of steps that we can follow one at a time and so maintain and build our motivation as each step succeeds. I love Yeung’s suggestion of having a ‘setback manifesto’, so that we can constructively review what’s happened if things go wrong, identify actions to take to reduce the likelihood of reoccurrence, and know how to behave if something similar happens again! Yeung describes 5 other capabilities of exceptional people, which would seem to ‘feed’ and sustain our authenticity. Curiosity or ‘awe’ enables us to develop our knowledge, pick up new ideas, be more creative. In a work situation this is what enables us to ‘work smarter not harder’: solve problems more effectively and innovate. Yeung encourages us to read widely – not only in our area of expertise, but across disciplines too. Incidentally he challenges the group approach to brainstorming, saying it is less effective than individual brainstorming and suggesting a new (4-tier) model, which combines the two. I will definitely be trying this different approach with teams. Connecting with people to achieve diversity in our contacts, but with an emphasis on ‘netfriending’ rather than ‘networking’ so that we build relationships with the people that we get to know. Yeung talks about ‘seeking the spark’ with people where connecting comes easily rather than forcing ourselves to try building relationships with everyone we meet. He also reminds us that making connections with people can come through speaking at and running events or courses, writing, joining committees, going to conferences etc. not just attending pure networking events. For those working within an organisation, connecting can come from going to lunch with people, joining task forces, or simply stopping by to say hello to colleagues. Cherishing is about building that rapport with people; having the emotional intelligence to put ourselves in other people’s shoes; really listening to others and giving them space to express themselves. Yeung also encourages us to look for the ‘3rd way’ in conflict situations in that both people could be right in their views, and the way forward could build on both views, rather than on only one or the other. Centredness is also a form of emotional intelligence. In this case it’s about developing our inner calm; cultivating more positive than negative inner thoughts; recognising that ‘thoughts are just thoughts’; and developing a mindfulness or focus on the here and now. Yeung has some very helpful exercises on how we can help ourselves feel better about both short-term and more serious emotional setbacks. Citizenship is all about integrity, being a responsible member of our community, and respecting the environment (sustainability). It’s about focusing on our personal legacy and managing our reputation. Without it, all the other efforts we might make at being exceptional could be wiped out! “E is for Exceptional” has been an inspirational book. 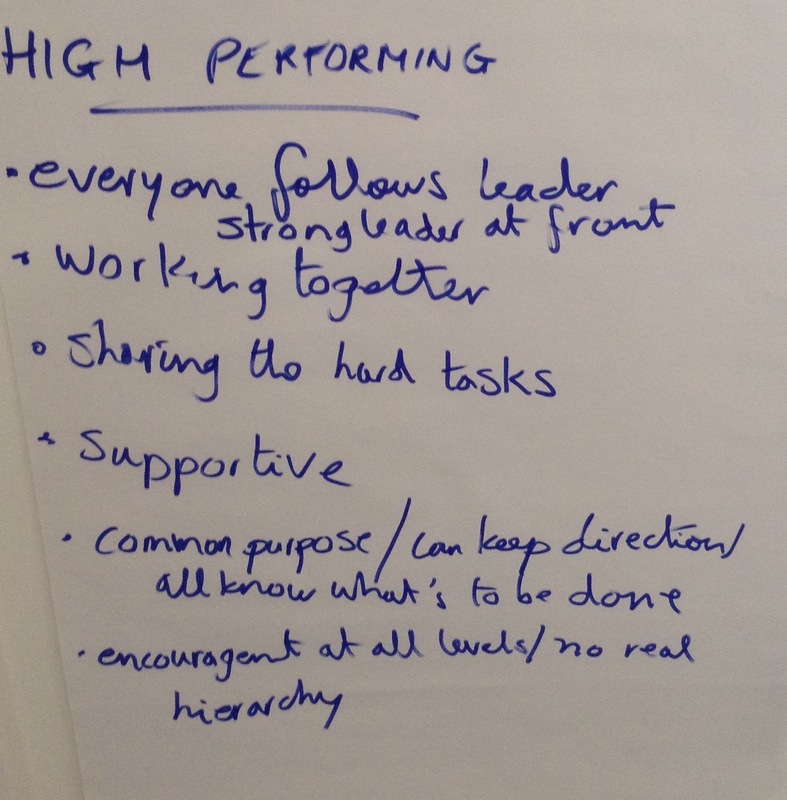 There are lots of ideas that I have taken away for developing my own capabilities, and I’m looking forward to exploring how these ideas can be applied to ‘Creating Exceptional Teams’ in my RiverRhee Consulting newsletter. Hopefully some of you will also pick up Rob Yeung’s book, and/or follow my newsletter. I do hope that anyone suffering from Monday morning blues will discover a way to banish them forever, and will be daring enough to follow it through!